To illustrate this concept of compounding the accumulated balance forward one year at a time, consider $2000 invested at the end of each year of the next five years. The current balance is 0, that’s why on this timeline, we indicate Time 0 as $0. The rate of return is 10%. Notice nothing happens till the end of Year 1 (marked as Time 1 on the timeline) when we make the $2000 investment. This first $2,000 earns interest for the next four years (and not five years because we are contributing at the end of the year, as opposed to beginning of the year). Also notice that the last $2,000 is invested at the end of the fifth year, so it earns no interest at all. 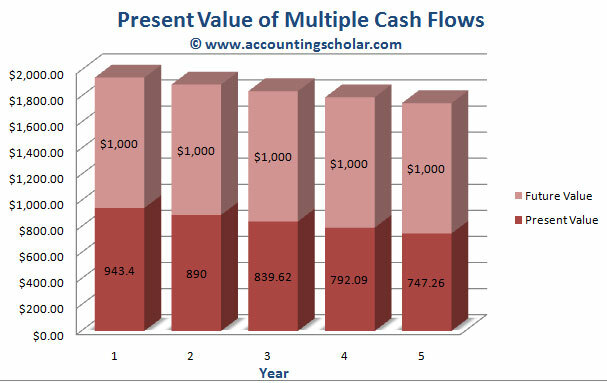 Thus at the end of the fifth year, we have a final answer of $12,210.20, that is the future value of all these present cash flows made through the years. Below is a graphical representation of the growth of this $2000 in each of the years for five years. This graph above shows the growth of $2,000 invested at the end of each year for the next five years at a rate of 10% return. The original investment of $2,000 per year is shown in pink while the beginning balance of each year in shown in green & the ending balance each year is shown in purple. 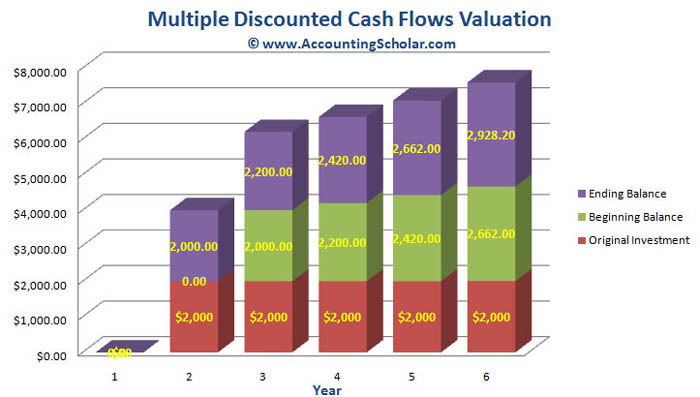 In the discount cash flow valuation of future cash flows, we looked at what could we have in 2 years if we invest $100 now and $100 in one year. In this tutorial, we look at what we need to determine the present value of a series of future cash flows, thus how much do we need now to have a set future value, of say $3000 in 2 years. The context is therefore slightly changed; we are looking at cash flows valuation from a present perspective. As an example, suppose you need $1000 in one year, and another $2000 more in two years. If you can earn 8% on your investments, how much do you have to put up today to exactly cover these amounts in the future? In paraphrased terms, what is the present value of the two cash flows at 8%? This graph above shows the present value of $1,000 for each of the next five years with the amount being reduced each year. For instance, the present value of $1,000 in the first year @ 12% rate of return is $943.40. If we do the present value calculation for each of the 5 years, we would end up with a final present value answer of $4,212.37.